Leave the beaten track occasionally and dive into the woods. Every time you do so you will be certain to find something that you have never seen before. Follow it up, explore all around it, and before you know it, you will have something worth thinking about to occupy your mind. All really big discoveries are the results of thought. I thought this quote by Alexander Graham Bell was especially fitting for this month’s Tattered Angels DT assignment — working with wood. You see I’m not much a wood girl — unlike others who had wood items laying around to alter and play with, I had to make a trip to the Goodwill for find some gems worth of glittery goodness. Jackpot! While these projects might not be a significant as Mr. Bell’s, I definitely enjoyed the journey and discovery. 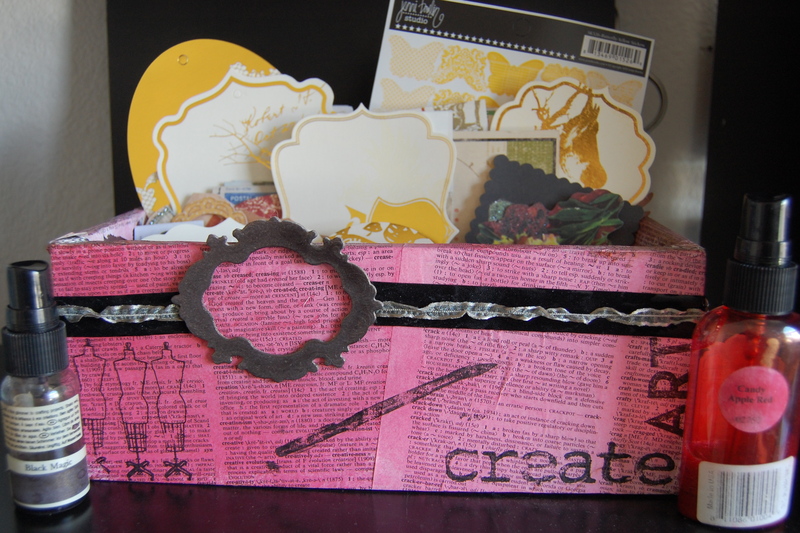 First up — an ephemera box, seriously who couldn’t use a place for all the tags and miscellaneous fun items that seem to be taking the crafting world by storm. 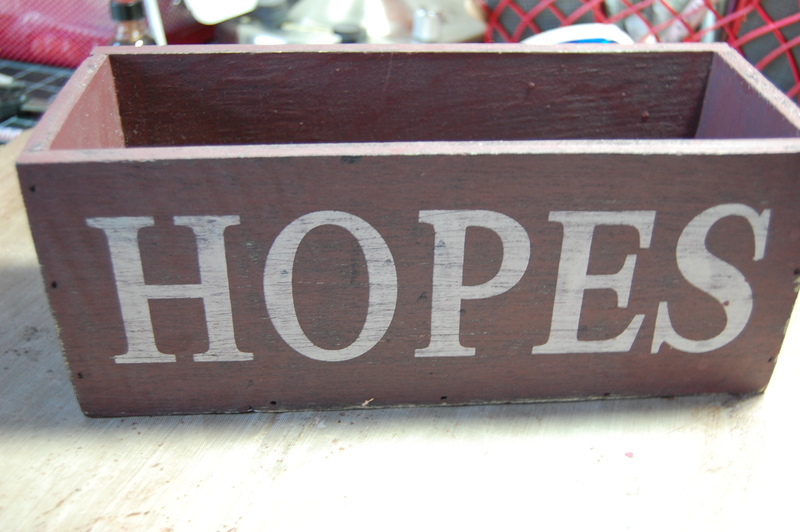 Originally, this box was just a plain wooden box with some ‘inspirational’ words. 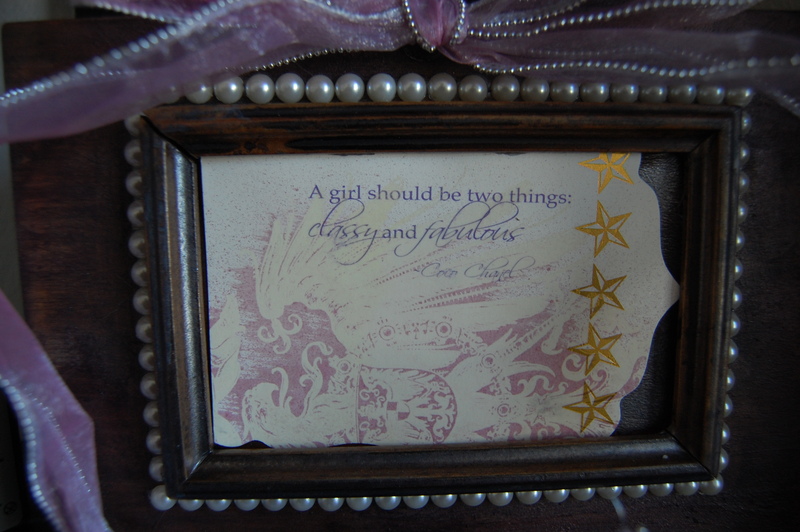 I decided to cover it with dictionary paper, and then misted the whole thing with Candy Red Glimmer Mist. 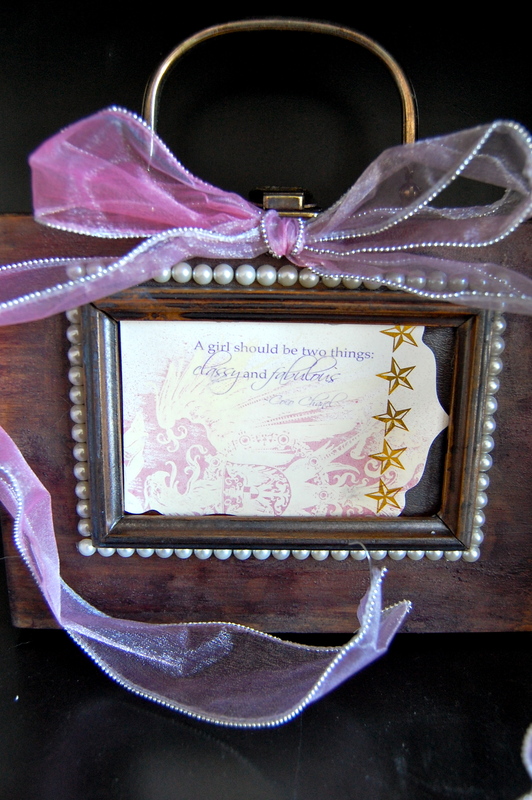 I used the frame from the Romance collection font misted with some black magic to highlight the word create. A few stamps just for fun and voila a perfect little box. Next up — A wooden tray, I bet you probably have one of these lying around. This one had playing cards and dominos as a design element, and while I may be a card shark, that design doesn’t fit my home esthetic. So I covered the inside with dictionary paper and coated with a mix of peacock chalkboard mist and turquoise blue glimmer mist. 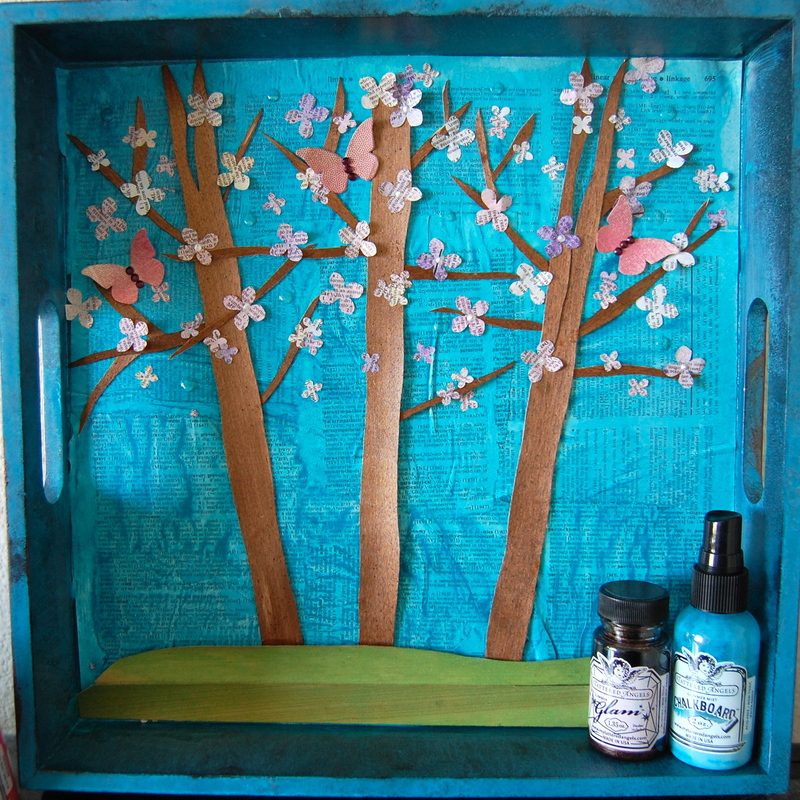 Then I got my hands on some strips of wood veneer (go ahead raid the hubby/BF/Dad’s workshop they won’t notice it’s missing and I promise not to tell) I painted the strips with Espresso Bean Glitter Glam and cut into shapes of trees and branches and a couple more in meadow green glimmer mist for the base. Punched some more dictionary paper that had been misted into flower shapes and started to glue. Finally — my favorite find. A wooden purse! This is where the discoveries really started to occur. I tried all sorts of combinations of glimmer mist on the cover and finally settled on this combo of silver and sugarplum fairy for the base. I added a resist tag with a great Chanel quote. Top is off with a ribbon spritzed with Strawberry Shortcake and Sugar Plum fairy. It’s a perfect place to store little treasures. So speaking of moving on and back into the crafty realm…if you’re my facebook friend then you already know this, but for the few people who read this that I don’t know and the facebook phobes I do know, I have an announcement. I’m so excited, I can hardly stand it. Think of all that glitter and glam I get to play with and you know how I love anything that sparkles, so this truly is a perfect fit. So would you like to see the projects, that got me to this happy place? Great, I’d love to show them to you and will throughout the next couple of weeks. 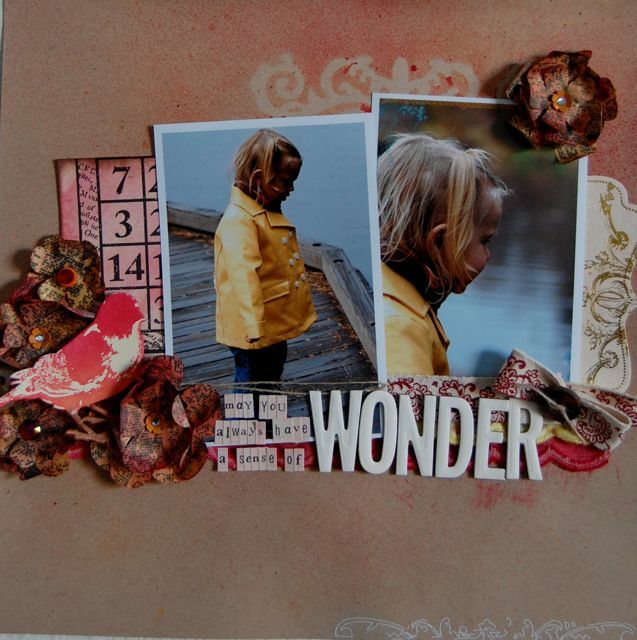 First up a happy little layout… The flowers are my favorite part about this layout, I made them using packing paper that comes with SC goodies, a newsprint stamp from Tattered Angels and the Slice.